Benjamin Satterley (born 22 August 1986) is an English professional wrestler currently working under the ring name Pac (also stylised in all capitals) for All Elite Wrestling (AEW) in the United States and Dragon Gate in Japan, where he is the current Open the Dream Gate Champion in his first reign and a member of the villainous R.E.D. stable. He also currently works on the international independent circuit as a freelancer. He is perhaps best known for his six-year tenure in WWE, where he competed under the ring name Neville (previously Adrian Neville). Satterley is noted for his high flying style and aerial attacks, which has earned him the nickname "The Man That Gravity Forgot". He began his wrestling career under the ring name Pac in North East England with a small promotion, the Independent Wrestling Federation (IWF), and after establishing himself in the United Kingdom with promotions such as Real Quality Wrestling and One Pro Wrestling, he began to perform overseas, most notably for the United States-based Pro Wrestling Guerrilla (PWG), Ring of Honor (ROH), and Chikara; and the Japan-based Dragon Gate, where he won the Open the Brave, Triangle, and Twin Gate Championship. He is a former PWG World Tag Team Champion, and winner of PWG's inaugural Dynamite Duumvirate Tag Team Title Tournament. From 2012–2015, Satterley wrestled in WWE's developmental territory NXT under the name Adrian Neville. In NXT, he won the NXT Tag Team Championship twice, with his first reign being one-half of the inaugural champions with Oliver Grey and the other reign with Corey Graves. He is also a one-time NXT Champion, thus making him the first man to have held both the NXT Championship and the NXT Tag Team Championship. Neville was promoted to the main roster in early 2015, and was later drafted to Raw in the 2016 draft. He began competing in the cruiserweight division that same year, and became a record two-time and longest reigning WWE Cruiserweight Champion. Benjamin Satterley was born on 22 August 1986 in Newcastle upon Tyne, the son of Stephen and Gill (sometimes Jill) Satterley. He was extremely active as a child and participated in sports such as football, hockey, roller hockey, basketball, and swimming. His interest in wrestling came about through one of his aunts, who was a fan of the World Wrestling Federation. His parents had banned him from watching wrestling at their house, so he would go to his aunt's house to watch it. His favourite wrestlers growing up were The Undertaker and "Hacksaw" Jim Duggan. By the age of 16, Satterly had wrestled with backyard wrestling organizations TWXW in Newcastle and FXW in nearby Middlesbrough. Even as one of the younger wrestlers in the group, Satterly's technical ability and athleticism ensured he was always in the most entertaining matches. Many of the FXW roster went on to form 3Count Wrestling (3CW), an organization Satterly would later return to. He started training as a wrestler on a more permanent basis at the age of 18 at St Joseph's Hall in Gateshead, described by Satterley as "pretty much the only wrestling school in the area". Satterley made his debut at Independent Wrestling Federation on 27 March 2004, under the ring name Pac, losing to Assassin. For the first two years of his career he wrestled mainly for IWF and 3 Count Wrestling. He won his first championship on 26 August 2005 when he teamed up with Harry Pain to defeat Chris Prime. In 2006 he began to wrestle all across Britain and Europe. Satterley later performed in British promotion 3 Count Wrestling. He debuted on 14 October 2005 and defeated EdEn and Falcon in the opening match. Pac then went on to capture the 3CW North East Championship on 24 February 2006. He then captured the 3CW Triple Crown Championship at an ICW event, which he held for 110 days. Pac was defeated in his last 3CW match by Liam Thomson on 30 April 2010. After joining One Pro Wrestling in May 2006, Pac became the first-ever Openweight Champion on 26 November after winning a battle royal. He successfully retained the title on several occasions before losing it to James Wallace on 30 June 2007 in a match that started immediately after PAC retained the title in a four-way match. On 29 December, Pac failed to reclaim the title after losing to then-champion Darren Burridge. In late April, Pac represented International Pro Wrestling: United Kingdom in the prestigious King of Europe Cup. He defeated Trent Acid in the first round before falling to Nigel McGuinness in the quarter finals. In 2007, Satterley began wrestling in the Italy-based Nu-Wrestling Evolution under the ring name Jungle Pac. As Jungle Pac, Satterley's character is that of a jungle native, which is emphasised by his attire consisting of a loincloth or a lava-lava over his trunks as well as being billed from "The Jungle". On 19 April 2008, Jungle Pac competed in a four-way ladder match for the vacant Cruiserweight Championship against Juventud Guerrera, Matt Cross and Super Nova, which was won by Guerrera. On 26 October, Jungle PAC wrestled against Guerrera and Super Nova in a three-way match for the Cruiserweight Title, but was unable to win the title. He wrestled against Guerrera and Nova in two more three-way matches for the title on 1 and 2 November, but was again unable to win the title. PAC wrestled in Premier British Wrestling (PBW) on two occasions before signing with WWE. On 17 November 2009, Pac debuted in American Wrestling Rampage during its European Invasion tour, and lost to Dunkan Disorderly in a three-way match also involving Shawn Maxer for the promotion's No Limits Championship. Two days later, he wrestled against Disorderly in a singles match for the title, but was defeated. After defeating Disorderly in tag-team matches over the next two days, Pac and Maxer wrestled against Disorderly for the No Limits Title in another three-way match on 22 November, but were again defeated. After trading wins with El Generico over the next few days, PAC finally won the title after defeating Generico and new champion Michael Knight on 29 November. After successfully retaining the title against Generico on 4 and 6 December, Pac lost the title to Dunkan Disorderly on 8 December. The next day, Pac and Generico defeated Disorderly and Shawn Maxer in a tag-team match. On 17 November 2006, Pac made his debut in Pro Wrestling Guerrilla. He competed against A.J. Styles in a losing effort of the first night of All Star Weekend IV. The next night, he faced El Generico in a match that was considered by those in attendance a serious Match of the Year contender. PAC returned to PWG on 24 February 2007, defeating Kevin Steen to pick up his first win in the promotion. He faced Generico again on 7 April, this time in the main event of the first night of All Star Weekend V with the PWG World Championship on the line. Generico once again came out on top. The next night, PAC faced All Japan Pro Wrestling star Kaz Hayashi in a losing effort. Pac was originally scheduled to compete in singles matches during the first PWG Dynamite Duumvirate Tag Team Title Tournament on 20 and 21 May. However, Roderick Strong's original partner, Jack Evans, had been called back to Dragon Gate at the last moment and decided to have PAC fill the vacant spot. After defeating Super Dragon and Davey Richards in the first round, Naruki Doi and Masato Yoshino in the second round and then The Briscoe Brothers in the finals, PAC and Strong won the tournament and as a result, became the new World Tag Team Champions. In their first title defence, Pac and Strong defeated The Havana Pitbulls (Ricky Reyes and Rocky Romero) at PWG's event Roger Dorn Night on 10 June. From 15 to 22 July, PAC took part and competed for Dragon Gate's biggest tour of the year, Wrestle Jam, where he and El Generico represented PWG alongside Ring of Honor representatives Austin Aries, Delirious, Jack Evans, Matt Sydal and Jimmy Rave. On 29 July, Pac and Strong were scheduled to defend their World Tag Team Championship against the Briscoe Brothers in a 2 out of 3 falls match. However, they were replaced by Kevin Steen and El Generico, who ended up winning World Tag Team Championship in a one fall match. PAC was among the 24 participants in the 2007 Battle of Los Angeles Tournament in Burbank, California that ran from 31 August to 2 September. He defeated Jack Evans in a first round match then Claudio Castagnoli in a second round match before losing to eventual tournament winner Cima in a semi-final round match. After almost a year-long absence from the company, PAC made his return to PWG at All Star Weekend VII on 30 August 2008, where he picked up the win for the team of himself and The Young Bucks by pinning Kevin Steen, who teamed with El Generico and Susumu Yokosuka. The next night, PAC was unsuccessful in his attempt to win the World Championship from then-champion Chris Hero. PAC returned to PWG on 23 July 2011, facing Kevin Steen in a losing effort. On 29 January 2012, at Kurt Russellreunion 3, PAC teamed with El Generico and Masato Yoshino to defeat Akira Tozawa, Kevin Steen and Super Dragon in a six-man tag team main event. In January 2007, Pac wrestled as part of Total Nonstop Action Wrestling's Impact! Total tour in Portugal along with fellow British wrestlers Spud, Jonny Storm and Jody Fleisch. Soon after the tour, Pac debuted in Ring of Honor at their 3 and 4 March shows at the Liverpool Olympia in Liverpool, England. On the first night, he lost to Roderick Strong in a match for the FIP World Heavyweight Championship. On the second, he was defeated by Matt Sydal. On 24 August, he returned to ROH in a losing effort against Bryan Danielson. At ROH's Manhattan Mayhem, he lost to Davey Richards. On 21 April, Pac debuted in Chikara at their show Rey De Voladores in a four-way elimination match against Chuck Taylor, Ricochet and Retail Dragon, which was won by Taylor. In August, Pac returned to Chikara at their International Invaders weekend. On the first night, he was defeated by Ricochet. The next night, he was defeated by Claudio Castagnoli. On 23 August, he participated at the eighth Ballpark Brawl, where he lost a six-way elimination match that featured Sterling James Keenan, Trent Acid, El Generico, Xtremo and John McChesney, which was won by Keenan. On 27 May 2012, Pac made his New Japan Pro-Wrestling debut, when he entered the 2012 Best of the Super Juniors tournament, defeating Jushin Thunder Liger in his first match. When the round-robin stage of the tournament concluded on 9 June, PAC finished with five wins out of his eight matches, winning his block and advancing to the semifinals of the tournament. He lost to Ryusuke Taguchi the following day, and was eliminated from the tournament. Shortly after participating in Pro Wrestling Guerrilla's Battle of Los Angeles tournament, Pac was invited to Dragon Gate for their Dragon Storm 2007 tour beginning on 8 September. The tour was the last for World Wrestling Entertainment-bound Matt Sydal, who on 14 September endorsed PAC to be his replacement on the Dragon Gate faction Typhoon. On 15 September, Pac defeated Dragon Kid for the Westside Xtreme Wrestling World Lightweight Championship. On 25 April 2008, Pac lost to Gamma in the first round of a tournament for the Open the Brave Gate Championship. On 31 May, Pac and Dragon Kid wrestled against fellow Typhoon members Ryo Saito and Susumu Yokosuka for the Open the Twin Gate Championship, but were unable to win. On 27 July, Pac, Dragon Kid and Anthony W. Mori represented Typhoon in a four-way match for the Open the Triangle Gate Championship, but were unable to defeat Gamma, Yamato and Yasushi Kanda for the title. After Typhoon disbanded in 2008, Pac joined World-1 in 2009. On 22 March 2009, Pac, BxB Hulk and Naoki Tanisaki represented World-1 in a losing effort to the Open the Triangle Gate Champions Kamikaze (Dragon Kid, Shingo Takagi and Taku Iwasa) in a three-way match also involving Real Hazard (Kenichiro Arai, Yamato and Yasushi Kanda). World-1 again challenged for the title on 24 May, but were defeated by the new champions Warriors-5 (Cima, Gamma and Kagetora). On 7 June, World-1 finally won the Open the Triangle Gate Championship after defeating Warriors-5. World-1 made their first successful title defence on 19 July, where they defeated Kamikaze (Akira Tozawa, Dragon Kid and Taku Iwasa). On 7 February 2010, Pac lost to K-ness in a match for the Open the Brave Gate Championship. On 5 July 2010, Pac made his debut for Dragon Gate's international expansion Dragon Gate USA, wrestling in a match where he and BxB Hulk were defeated by Yamato and Shingo. At the following day's tapings of the Uprising pay-per-view, PAC and Naruki Doi defeated Jigsaw and Mike Quackenbush. On 14 October, World-1 lost the Open the Triangle Gate Title to Akebono, Fujii and Mochizuki in a rematch. On 20 December 2010, Dragon Gate USA announced that they had signed PAC to a contract that would make him a regular member of the promotion's roster. On 30 January 2011, PAC and Masato Yoshino defeated Chuck Taylor and Johnny Gargano to become Dragon Gate USA's first ever Open the United Gate Champions. On 11 September, Pac and Yoshino lost the Open the United Gate Championship to Open the Twin Gate Champions, Cima and Ricochet, in a title vs. title match. On 29 August 2010, Pac defeated Susumu Yokosuka in a tournament final to win the vacant Open the Brave Gate Championship for the first time. On 14 April 2011, Pac, BxB Hulk and Susumu Yokosuka failed to win the Open the Triangle Gate Championship from Blood Warriors (Cima, Dragon Kid and Ricochet) and, as a result, World-1 was forced to disband. On 24 April former World-1 members PAC, Hulk, Yokosuka and Yoshino agreed to form a new alliance with Masaaki Mochizuki to battle Blood Warriors. On 8 June, the new group was named Junction Three in reference to it being a union between the former members of World-1, Kamikaze and the Veteran-gun. On 19 June, Pac and Dragon Kid defeated the Blood Warriors team of Ryo Saito and Genki Horiguchi to win the Open the Twin Gate Championship. They lost the title to Blood Warriors representatives Cima and Ricochet on 17 July. On 19 November, Pac lost the Open the Brave Gate Championship to Ricochet, ending his record reign at 447 days. On 9 February 2012, Junction Three was forced to disband, after losing a fourteen-man elimination tag team match to Blood Warriors. On 4 March, Pac received a shot at Dragon Gate's top title, the Open the Dream Gate Championship, but was defeated by defending champion, Cima. On 25 March 2012, Pac joined Masato Yoshino, Naruki Doi, Ricochet, and Rich Swann and formed World-1 International. On 6 May 2012, Pac, alongside World-1 International members Masato Yoshino and Naruki Doi defeated Genki Horiguchi H.A.Gee.Mee!, Jimmy Kanda, and Ryo "Jimmy" Saito at the 2012 Dead or Alive pay-per-view to become the 34th Open the Triangle Gate Champions. On 22 July, Pac made his final Dragon Gate appearance, during which he, Yoshino and Doi successfully defended the Open the Triangle Gate Championship in a three-way match. In July 2012, it was reported that Satterley had signed a contract with WWE. He joined WWE's developmental territory NXT, and made his television debut using the ring name Adrian Neville on the 16 January 2013 episode of NXT, where he defeated Sakamoto. Together with Oliver Grey, the English duo won a tournament to crown the inaugural NXT Tag Team Champions by defeating The Wyatt Family (Luke Harper and Erick Rowan) in the finals on the 13 February episode of NXT. Neville and Grey, now billed as British Ambition had earlier defeated 3MB (Heath Slater and Drew McIntyre) in the first round and Kassius Ohno and Leo Kruger in the semi-finals. With Grey out injured with a torn ACL (in storyline inflicted by the Wyatt Family), Neville chose Bo Dallas as his new partner in April. On 24 April on NXT, Neville lost to Antonio Cesaro while challenging for his United States Championship. On the 8 May episode of NXT, Neville and Dallas failed in their first defence of the tag title when they lost them to the Wyatt Family. On the 29 May episode of NXT, Neville competed in an NXT Championship number one contender battle royal, eliminating Mason Ryan and Bray Wyatt (who had eleven and two eliminations respectively) to make it to the final two participants, but his former tag partner Dallas eliminated him to win the match. Later, Dallas won his title match to become NXT Champion. Neville continued his feud with the Wyatt Family by losing to them in two six-man tag matches, once while teaming with Corey Graves and Kassius Ohno, and once with Graves and William Regal. On 20 June, Neville regained the NXT Tag Team Championship from the Wyatt Family with a new partner in Graves. On the 6 August episode of NXT, Neville faced Dean Ambrose for his United States Championship, which Ambrose retained when the other members of The Shield caused a disqualification. Neville and Graves lost the title to The Ascension (Conor O'Brian and Rick Victor) in September. Following this, the two feuded after failing to regain the title. Neville first became number one contender to the NXT Championship on the 27 November episode of NXT by defeating Sami Zayn, after both men previously tied a beat the clock challenge. Neville faced former tag partner Bo Dallas for the title on the next episode and won by countout, which meant that the title did not change hands. Two episodes later, Neville faced Dallas again for the title in a lumberjack match, but lost when lumberjack Tyler Breeze interfered. Neville once again became number one contender after Dallas failed to defeat Neville in a beat-the-clock challenge match on the 22 January episode of NXT that arose due to Dallas' boasting. At NXT Arrival, Neville won the NXT Championship from Dallas in a ladder match. A rematch was scheduled for the 20 March episode of NXT, which he won after debuting a new finisher, the imploding 450° splash. Neville's first feud as champion began following a non-title match against Brodus Clay, where Neville won by countout. The feud ended with Neville scoring a No Disqualification match victory over Clay to successfully defend the NXT Championship. At NXT TakeOver, Neville successfully defended the NXT Championship against Tyson Kidd. Two weeks later, Neville retained his championship against Kidd again after Natalya prevented Kidd from using a chair. On the 31 July episode of NXT, he successfully defended his title against Tyler Breeze by disqualification as Tyson Kidd attacked Neville after being super kicked by Neville. On 8 September, Neville made his first appearance on Raw as part of an NXT showcase match to promote NXT TakeOver: Fatal 4-Way, he teamed with Sami Zayn to defeat Kidd and Breeze in a tag team match. On 11 September at the NXT TakeOver: Fatal 4-Way event, Neville successfully defended his NXT Championship against Sami Zayn, Tyler Breeze and Tyson Kidd in a fatal four-way match. On 4 December, Neville became the longest reigning NXT Champion of all time, surpassing the record set by Bo Dallas (which was surpassed by Finn Bálor in April 2016). Later on 11 December at the NXT TakeOver: R Evolution event, Neville lost the championship to Zayn, ending his reign at 287 days. When Zayn offered a handshake, Neville kicked it away and instead hugged Zayn in respect. The following week on the 18 December episode of NXT, Neville faced Kevin Owens, but the match ended in a double countout. Owens powerbombed Neville into the apron after the match. Neville received a rematch on the 15 January 2015 episode of NXT, but failed to regain the title. Neville went on to compete in a NXT Championship number one contender's tournament, defeating Tyson Kidd in the quarterfinals on 28 January and Baron Corbin in the semifinals on 4 February, but lost in the finals to Finn Bálor at NXT TakeOver: Rival. On the 30 March 2015 episode of Raw, Satterly made his main roster debut, under the shortened ring name Neville, defeating Curtis Axel. His first storyline was a feud against Bad News Barrett, defeating him on the Extreme Rules pre-show, where he defeated Bad News Barrett. They had another match in the finals of the 2015 King of the Ring tournament, where he was defeated by Barrett. Their final match took place on the May 18 episode of Raw, where Neville was defeated by Barrett. After the match, Neville would be attacked by former rival Bo Dallas, setting up a match at Elimination Chamber, which Neville won. Neville would then enter a feud with Stardust in a comic book inspired rivalry, due to Neville's superhero-esque motif and the latter's gimmick of a supervillain. On the 10 August episode of Raw, after Neville defeated King Barrett, Stardust as the prince of dark matter would confront actor Stephen Amell, who was in attendance in the front row, and slap him. Amell would then jump the barricade and attack Stardust until security would break up the brawl. At SummerSlam, Neville would team up with Amell, defeating the team of Stardust and Barrett. At Night of Champions kick-off show, Neville would team with The Lucha Dragons (Kalisto and Sin Cara) in a losing effort against Stardust and the Ascension. On 3 October at the Live from Madison Square Garden special event, Neville would defeat Stardust, ending their feud. After Seth Rollins suffered a knee injury during a live event, WWE announced a tournament for the vacant WWE World Heavyweight Championship would take place. On the 12 November episode of SmackDown, Neville would defeat King Barrett in the first round, before being defeated by Kevin Owens in the quarter-finals on the 16 November episode of Raw. At Survivor Series pre-show, Neville would compete in a 5-on-5 traditional Survivor Series elimination tag team match, teaming with The Dudley Boyz (Bubba Ray Dudley and D-Von Dudley), Goldust and Titus O'Neil, defeating the team of Stardust, The Ascension, The Miz and Bo Dallas. On the 21 December episode of Raw, Neville won the Slammy Award for "Breakout Star of the Year". At 2016 Royal Rumble, Neville competed in his first Royal Rumble match as the number 16 entrant, lasting over 10 minutes before being eliminated by Luke Harper. On the 28 January episode of SmackDown, Neville challenged Kalisto for WWE United States Championship in a losing effort. On the 14 March episode of Raw, during his match with Chris Jericho, Neville fractured his ankle, leaving him out of action for four months and forcing him to miss WrestleMania 32. On 12 July Neville made his non-televised return to action, defeating Bo Dallas in a dark match before a SmackDown taping. On 19 July, at the 2016 WWE draft, Neville was drafted to Raw in the sixth round (26th overall). On the 25 July episode of Raw, Neville made his televised return, defeating Curtis Axel. On 21 August, at the SummerSlam pre-show, Neville would team up with Sami Zayn, defeating The Dudley Boyz. The following night on Raw, Neville failed to defeat Kevin Owens to qualify for a fatal four-way elimination match for the vacant WWE Universal Championship after the interference of Chris Jericho who would defeat Neville the following week. On the 10 October episode of Raw, Neville teamed with Sami Zayn to face Bo Dallas and Curtis Axel in a winning effort, but lost to Dallas the following week. On the 31 October episode of Raw, Neville participated in the Battle Royal for a spot on Team Raw at Survivor Series, but was eliminated by eventual winner Braun Strowman. Neville became absent from television following this. On 18 December at Roadblock: End of the Line, Neville returned to seemingly congratulate Cruiserweight Champion Rich Swann after his match only to attack Swann and his opponent TJ Perkins, turning into a villain for the first time in WWE and joining the Cruiserweight division. The following night on Raw, Neville cemented his villainous turn after claiming that the fans only cheered him because he was "vulnerable or small" and proceeded to attack Swann along with Brian Kendrick after he interrupted him, followed by Perkins after he attempted to save Swann. Over the coming weeks, Neville would defeat multiple Cruiserweights in singles competition including Perkins, Cedric Alexander, Lince Dorado and Swann in a non-title match. On 29 January 2017 at the Royal Rumble, Neville defeated Swann to capture the Cruiserweight Championship for the first time, marking his first title win on the main roster. Neville then started a feud with Jack Gallagher, and successfully defended his title at Fastlane against Gallagher. The following night on Raw, Neville defended his title against Swann successfully. After the match, Austin Aries seemingly appeared to interview Neville only to attack him and start a feud between the two. At WrestleMania 33, Neville would defeat Aries in his WrestleMania in-ring debut. Aries won a fatal-four-way match two days later on 205 Live, to earn a rematch against Neville at Payback, which Neville lost by disqualification, retaining the title as a result. Around this time, Neville formed an alliance with TJ Perkins, who would assist him in his rivalry with Aries, in exchange for a promised championship opportunity. Neville defeated Aries again in a submission match at Extreme Rules to retain the Cruiserweight Championship, concluding their rivalry in the process. He ended his alliance with Perkins the following night, attacking him and later going on to successfully defend his championship against him on the 6 June episode of 205 Live. Neville then began feuding with Akira Tozawa who was granted a championship match for Great Balls of Fire by Titus O'Neil, in which Neville retained the title. He was also set to defend his title against Tozawa for the second time at SummerSlam, until the 14 August episode of Raw, where Neville lost the championship to Tozawa, ending his record setting reign at 197 days. However, Neville won the title back from Tozawa on the SummerSlam pre-show, making him the first-ever two-time WWE Cruiserweight Champion with the current belt. On the 21 August episode of Raw, it was announced that Tozawa had invoked the rematch clause. Neville defeated Tozawa by submission on the 22 August episode of 205 Live to end their feud. Afterwards, he was confronted by Enzo Amore, the latest member of the Cruiserweight division. On 24 September at No Mercy, Neville dropped the title to Amore after being hit with a low blow while the referee was distracted. The following night on Raw, while Amore was disparaging the cruiserweight division, Neville spoke on behalf of the cruiserweights and attempted to attack Amore. Amore revealed he had a no-contact clause, which prevents any of the cruiserweights of receiving a future title shot should they attack him, but Neville attacked him nonetheless after the cruiserweights prevented Amore from leaving. The next night on 205 Live, after Neville defeated Ariya Daivari, he was attacked by Amore with a crutch. This would be Neville's final appearance on WWE programming. On 10 October, multiple sources reported that Neville had walked out on the previous day's Raw and "appeared" to have quit the promotion, with one report stating that he had been unhappy for a while. He was reportedly supposed to have faced and been defeated by Amore at the show, but was replaced by Kalisto. WWE denied that Neville had left the promotion. On 13 November, a new report stated that there had been "positive discussions" between Neville and WWE with some in the company believing he could be on his way back. In January 2018, Fightful reported that WWE had frozen Neville's contract, keeping him under contract indefinitely or until a release is agreed upon. On 24 August, it was reported that Neville was no longer under contract. After his return to Dragon Gate, it was announced that PAC has also been booked for independent promotions Revolution Pro Wrestling and Defiant Wrestling. In January 2019 it was revealed that Pac would be one of the first signees to All Elite Wrestling, a new wrestling promotion started by wrestlers Cody Rhodes and The Young Bucks. Neville utilizes a corkscrew shooting star press, known as the "Red Arrow", which he uses as a finishing maneuver. After his return to Dragon Gate in 2018, he renamed it "the Black Arrow." After turning into a villain in December 2016, Neville started using a double underhook crossface, called the "Rings of Saturn" as a finisher. 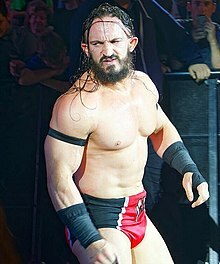 During his independent career and the first part of Neville's run in WWE, he was known as "The Man That Gravity Forgot"' due to his high flying style and aerial attacks. [unreliable source?] After his villainous turn and move to 205 Live, Neville became known as the "King of the Cruiserweights". Former wrestler and WWE Hall of Famer Mark Henry assisted Neville in creating his villain character, including moments like Neville going to the top rope to tease his "Red Arrow" move only to jump down without performing the move and lock in a submission to agitate the crowd. Satterley is a supporter of his hometown football club Newcastle United FC. His favorite band is The Specials, and his WWE ring name was a reference to one of their former band members, Neville Staple. Satterley made his video game debut as a playable character in WWE 2K15 as Adrian Neville, in which he has his own path in the "Who Got NXT" mode for the PlayStation 3 and Xbox 360 versions of the game, documenting his matches in NXT. He is also a playable character in WWE 2K15 for the PlayStation 4 and Xbox One versions in the "MyCareer" Mode, after clearing 1,000 followers or more upon being promoted to the Raw brand. He appeared as Neville in WWE 2K16, WWE 2K17, and WWE 2K18. He appeared in Xavier Woods' YouTube series UpUpDownDown, as both himself and Gentleman Rudeboy. Along with Sasha Banks in a team nicknamed Nasha, he won the inaugural WWE Superstars Rocket League Tag Team Tournament, defeating Huggin' Uppercuts (Cesaro and Bayley) in the semi-finals and The Royal 1s (A.J. Styles and Charlotte Flair) in the final to win the titles. The tournament was hosted by The New Day (Woods, Big E, and Kofi Kingston). Neville had a 287-day reign as NXT Champion. ^ "Adrian Neville "Break Orbit" Authentic T-Shirt". wwe.com. ^ a b c d "PAC Profile". Wrestlingdata. Retrieved 3 April 2019. ^ "Neville". Retrieved 12 May 2016. ^ a b c d "WWE profile". WWE. Retrieved 12 January 2018. ^ Johnson, Mike (24 January 2019). "THE FORMER NEVILLE, PAC, HEADING TO WRESTLECON". PWInsider. Retrieved 3 April 2019. ^ a b Caldwell, James. "WWE NXT Report CALDWELL'S WWE NXT TAKEOVER RESULTS 12/11: Complete virtual-time coverage of Neville vs. Zayn for the NXT Title, Itami & Balor, Charlotte, Kevin Steen/Owens's debut, Corey Graves retires". Pro Wrestling Torch. Retrieved 12 December 2014. ^ a b Keller, Wade (29 January 2017). "KELLER'S WWE ROYAL RUMBLE REPORT 1/29: Ongoing results updated throughout evening including Owens-Reigns, Styles-Cena, Rumble match". Pro Wrestling Torch. Retrieved 26 August 2017. ^ a b Keller, Wade (20 August 2017). "KELLER'S WWE SUMMERSLAM REPORT 8/20: Lesnar vs. Strowman vs. Joe vs. Reigns, Jinder vs. Nakamura, Naomi vs. Natalya". Pro Wrestling Torch. Retrieved 26 August 2017. ^ a b c d e f g h i j k "OWOW profile". Archived from the original on 20 August 2009. ^ "WWE Exclusive: Adrian Neville's Mum Reveals All As He Returns Home to Newcastle". MTV.co.uk. 20 January 2015. Retrieved 18 August 2015. ^ "Adrian Neville's Newcastle homecoming". WWE Official YouTube Channel. 9 December 2014. Retrieved 23 August 2015. ^ "3CW North East Championship". Cagematch. Retrieved 4 February 2017. ^ "3CW Triple Crown Championship". Cagematch. Retrieved 4 February 2017. ^ "King of Europe Cup results". ^ a b c "Cagematch match listings, NWE". ^ a b c d e f "Cagematch match listings, AWR". ^ a b "DDT4 results – Night one". ^ a b "DDT4 results – Night two". ^ a b "Cagematch match listings, PWG". ^ Caldwell, James (24 July 2011). "PWG News: New PWG champion – impromptu title match concludes "PWG 8" Saturday night". Pro Wrestling Torch. Retrieved 24 July 2011. ^ Settles, Pat (30 January 2012). "1/29 PWG results Los Angeles, Calif.: Dream six-man tag main event, Richards & Smith, Dragon Gate stars". Pro Wrestling Torch. Retrieved 25 February 2012. ^ "TNA: Brits Added to Portugal Tour". ^ "Past Events". Ring of Honor. Retrieved 7 April 2012. ^ "NJPW 40th anniversary Tour Best of the Super Jr. XIX ～The door to the glory～". New Japan Pro Wrestling (in Japanese). Retrieved 9 June 2012. ^ "NJPW 40th anniversary Tour Best of the Super Jr. XIX ～The door to the glory～". New Japan Pro Wrestling (in Japanese). Retrieved 10 June 2012. ^ "Cagematch match listings, Dragon Gate page 1". ^ a b c d e f g "Cagematch match listings, Dragon Gate page 2". ^ a b "Cagematch match listings, Dragon Gate page 3". ^ Bresson, D'Arcy (8 May 2010). "5/7 DGUSA in Windsor/Detroit: DGUSA debuts in Canada with BxB Hulk & Pac vs. Yamato & Shingo, Cima vs. Jacobs". Pro Wrestling Torch. Retrieved 21 December 2010. ^ Radican, Sean (5 July 2010). "Radican's DGUSA "Uprising" PPV review: Shingo & Yamato vs. Kid & Cima, Pac & Doi vs. Quackenbush & Jigsaw". Pro Wrestling Torch. Retrieved 21 December 2010. ^ Caldwell, James (20 December 2010). "DGUSA News: Business changes in 2011 – new talent signings, more frequent shows, video upgrade, more". Pro Wrestling Torch. Retrieved 21 December 2010. ^ a b Thomas, Jeremy (30 January 2011). "Dragon Gate USA's United Finale Taping Results (spoilers)". 411Mania. Retrieved 30 January 2011. ^ Radican, Sean (11 September 2011). "Radican's DGUSA Internet PPV report 9/11: Ongoing coverage of DGUSA show from Milwaukee". Pro Wrestling Torch. Retrieved 11 September 2011. ^ a b Boutwell, Josh (30 August 2010). "Viva La Raza! Lucha Weekly". WrestleView. Archived from the original on 1 September 2010. Retrieved 30 August 2010. ^ "2/9 Truth Gate, Blood Warriors vs. Junction Three Finale – 09 Feb 2012". iHeartDG. 9 February 2012. Retrieved 10 February 2012. ^ Johnson, Mike (8 July 2012). "WWE signs international star". Retrieved 8 July 2012. ^ Radican, Sean (11 July 2012). "Confirmed – Pac signs with WWE". Pro Wrestling Torch. Retrieved 11 July 2012. ^ James, Justin. "James's WWE NXT report 1/16: Pac debuts, released Barreta & injured Kidd wrestle, Sandow and Cesaro(?) team, Overall Reax". Pro Wrestling Torch. Retrieved 18 January 2013. ^ James, Justin. "James's WWE NXT results 2/13 – Week 33: First NXT tag champions crowned, Paige vows to take over the show". Pro Wrestling Torch. Retrieved 24 February 2013. ^ Bishop, Matt. "WWE NXT: HBK kicks off tag title tournament". Slam! Wrestling. Retrieved 25 January 2013. ^ James, Justin. "James's WWE NXT report 2/6 – Week 32: Tag Tournament continues, Bo Dallas's main-roster debut carries over, Overall Reax". Pro Wrestling Torch. Retrieved 15 February 2013. ^ James, Justin. "JAMES'S WWE NXT REPORT 4/3 – Week 40: Big E. defends NXT Title, final hype for Regal-Ohno, Overall Reax". Pro Wrestling Torch. Retrieved 19 August 2013. ^ Namako, Jason. "WWE NXT Results – 4/25/13 (Clash of Champions edition)". WrestleView. Retrieved 16 June 2013. ^ Santiago, Andres (3 May 2013). "WWE NXT spoilers from Winter Park, FL: John Cena and more". Pro Wrestling Insider. Retrieved 3 May 2013. ^ James, Justin. "JAMES'S WWE NXT REPORT 5/8 Week 45: Wyatt Family captures Tag Titles, Ohno turning face?, Sandow in action, Paige vs. Summer Rae feud continues, Overall Reax". Pro Wrestling Torch. Retrieved 2 June 2013. ^ James, Justin. "James's WWE NXT results 5/29 & 6/5: Wyatts defend Tag Titles, NXT Women's Title introduced, #1 contender battle royal, Parade of released NXT wrestlers in matches". Pro Wrestling Torch. Retrieved 6 June 2013. ^ James, Justin. "James's WWE NXT report 6/12: Bo Dallas captures NXT Title from Big E., outstanding Generico vs. Cesaro match, Women's Title tournament continues, Wyatts". Pro Wrestling Torch. Retrieved 18 June 2013. ^ James, Justin. "James's WWE NXT results 6/19: Wyatts vs. Ohno & Graves & Neville six-man tag, Summer Rae wins tourney match, El Generico, Xavier Woods, more". Pro Wrestling Torch. Retrieved 26 August 2013. ^ James, Justin. "James's WWE NXT report 7/10: Wyatts vs. Team Regal six-man main event, NXT Women's Title tourney continues, Generico (Zayn), Mason Ryan, set-up for Charlotte's debut". Pro Wrestling Torch. Retrieved 14 July 2013. ^ Caldwell, James (21 June 2013). "WWE News: NXT spoilers for summer episodes – first NXT Women's champ, Flair, more, plus NXT TV in the U.S.?". Pro Wrestling Torch. Retrieved 26 June 2013. ^ Trionfo, Richard. "WWE NXT REPORT: UNITED STATES TITLE ON THE LINE; NXT TITLE ON THE LINE; DANCE SUPREMACY IN NXT ON THE LINE; TYLER BREEZE IS TYLER BREEZE; AND MORE". PWInsider. Retrieved 9 August 2013. ^ James, Justin (21 November 2013). "James's WWE NXT report 11/20 – Week 73: Bo Dallas returns, Beat the Clock Challenge ensues, Ohno/Hero wrestles prior to his release, Overall Reax". Pro Wrestling Torch. Retrieved 3 January 2014. ^ James, Justin (29 November 2013). "James's WWE NXT results 11/27 – Week 74: Yoshi Tatsu resurfaces, Hero wrestles pre-release, Zayn/Generico vs. Neville/Pac flashback, Overall Reax". Pro Wrestling Torch. Retrieved 3 January 2014. ^ James, Justin. "James's WWE NXT report 12/4 – Week 75: Bo Dallas vs. Neville NXT Title match, Kidd in action, Paige vs. Natalya full-length Divas match, Overall Reax". Pro Wrestling Torch. Retrieved 8 March 2014. ^ James, Justin. "James's WWE NXT report 12/18 – Week 77: NXT Title match, Davey Richards & Eddie Edwards in a WWE ring, Kidd & Zayn, Divas champ in action, Overall Reax". Pro Wrestling Torch. Retrieved 8 March 2014. ^ James, Justin. "James's WWE NXT results 1/22 – Week 82: NXT Title developments heading into live Network episode, plus Miz, Cesaro, Natalya, Woods, Zayn/Generico, more; Overall Reax". Pro Wrestling Torch. Retrieved 8 March 2014. ^ Howell, Nolan. "NXT ArRival: Neville reaches for the gold". SLAM! Sports: Wrestling. Canadian Online Explorer. Retrieved 6 March 2014. ^ James, Justin (2014-12-18). "JAMES'S WWE NXT REPORT 12/18 – WEEK 131: Takeover fall-out, including Neville vs. Owens, Zayn's tiitle win, more; Overall Reax". Pro Wrestling Torch. Retrieved 2014-12-27. ^ Caldwell, James (30 March 2015). "CALDWELL'S WWE RAW RESULTS 3/30: Complete "virtual-time" coverage of live Raw - WM31 fall-out, Lesnar seeks & destroys, WWE Title match teased, Sting on WWE Network". Pro Wrestling Torch. Retrieved 31 March 2015. ^ Caldwell, James (26 April 2015). "CALDWELL'S EXTREME RULES PPV REPORT 4/26 (pre-show): Ongoing "virtual-time" coverage of BNB vs. Neville, more". Pro Wrestling Torch. Retrieved 26 April 2015. ^ Orr, James (29 April 2015). "WWE King Of The Ring 2015 results: Bad News Barrett beats Neville to be crowned first king since 2010". The Independent. Retrieved 30 April 2015. ^ Caldwell, James (18 May 2015). "CALDWELL'S WWE RAW RESULTS 5/18: Complete "virtual-time" coverage of live Raw - Payback PPV fall-out, two title matches, packed show includes major Lana-Rusev developments and NXT champ debuting, more". Pro Wrestling Torch. Retrieved 21 May 2015. ^ Jeff, Laboon. "Neville def. Bo Dallas". WWE. Retrieved 31 May 2015. ^ Caldwell, James (23 August 2015). "Caldwell's SummerSlam report 8/23: Ongoing "virtual-time" coverage of Lesnar vs. Taker, Title vs. Title, more big matches". Pro Wrestling Torch. Retrieved 23 August 2015. ^ Keller, Wade (19 December 2016). "KELLER'S WWE ROADBLOCK PPV REPORT 12/18: Owens vs. Reigns, Charlotte vs. Banks, New Day vs. Sheamus & Cesaro, Sami vs. Strowman". Pro Wrestling Torch. Retrieved 26 August 2017. ^ Keller, Wade (19 December 2016). "KELLER'S WWE RAW REPORT 12/19: Fallout from Roadblock including Jericho explaining his actions and putting Santa on his list". Pro Wrestling Torch. Retrieved 27 December 2016. ^ Keller, Wade (5 March 2017). "KELLER'S WWE FASTLANE PPV REPORT 3/5: Owens vs. Goldberg for Universal Title, Bayley vs. Charlotte, Reigns vs. Strowman". Pro Wrestling Torch. Retrieved 26 August 2017. ^ Keller, Wade (6 March 2017). "KELLER'S WWE RAW REPORT 3/6: Fallout from Fastlane including Jericho asking Owens for explanation for breaking up their friendship, Goldberg-Lesnar, Undertaker-Roman". Pro Wrestling Torch. Retrieved 26 August 2017. ^ Keller, Wade (2 April 2017). "KELLER'S WRESTLEMANIA 33 KICKOFF SHOW 4/2: Renee hosts panel with HBK, Lawler, Booker, Kickoff Match results ongoing". Pro Wrestling Torch. Retrieved 26 August 2017. ^ Galizia, Joey (4 April 2017). "6/6 WWE 205 LIVE REPORT: Neville vs. TJP main events second good episode in a row, Cedric-Dar, Valle-Ali". Pro Wrestling Torch. Retrieved 26 August 2017. ^ Keller, Wade (30 April 2017). "KELLER'S WWE PAYBACK PPV REPORT 4/30: Ongoing updates on House of Horrors, Owens vs. Jericho, Reigns vs. Strowman". Pro Wrestling Torch. Retrieved 26 August 2017. ^ Keller, Wade (4 June 2017). "KELLER'S WWE EXTREME RULES PPV REPORT 6/4: Balor vs. Joe vs. Rollins vs. Reigns vs. Wyatt for Universal Title shot". Pro Wrestling Torch. Retrieved 26 August 2017. ^ Keller, Wade (5 June 2017). "KELLER'S WWE RAW REPORT 6/5: Extreme Rules fallout including Samoa Joe's win, plus Enzo and Angle mysteries". Pro Wrestling Torch. Retrieved 26 August 2017. ^ Galizia, Joey (6 June 2017). "6/6 WWE 205 LIVE REPORT: Neville vs. TJP main events second good episode in a row, Cedric-Dar, Valle-Ali". Pro Wrestling Torch. Retrieved 26 August 2017. ^ Keller, Wade (9 July 2017). "KELLER'S WWE GREAT BALLS OF FIRE PPV REPORT 7/9: Lesnar vs. Joe, Braun vs. Reigns, Seth vs. Bray, Dean vs. Miz". Pro Wrestling Torch. Retrieved 26 August 2017. ^ Keller, Wade (21 August 2017). "KELLER'S WWE RAW REPORT 8/21: The Summerslam fallout including Lesnar and Heyman celebrating win". Pro Wrestling Torch. Retrieved 26 August 2017. ^ Weir, Allan (24 August 2017). "8/22 WWE 205 LIVE REPORT: Detailed results and analysis of the show". Pro Wrestling Torch. Retrieved 26 August 2017. ^ Currier, Joseph (10 October 2017). "Neville's future in WWE uncertain after walking out before Raw". Wrestling Observer Newsletter. Retrieved 11 October 2017. ^ Keller, Wade (11 October 2017). "Neville walks out on WWE on Monday night, plans changed, Neville's future in WWE in doubt (w/Keller's Analysis)". Pro Wrestling Torch. Retrieved 11 October 2017. ^ Johnson, Mike (13 November 2017). "Yet another WWE return on the horizon?". Pro Wrestling Insider. Retrieved 13 November 2017. ^ Sapp, Sean Ross (January 26, 2018). "Exclusive Update On Neville's Status With WWE". www.fightful.com. Retrieved 23 May 2018. ^ "Neville No Longer Under WWE Contract". 24 August 2018. ^ Crosby, Jack (January 1, 2019). "New promotion All Elite Wrestling announced along with AEW Double or Nothing event". CBS Sports. Retrieved January 1, 2019. ^ Satin, Ryan (January 8, 2019). "WATCH: All Elite Wrestling Rally Outside of TIAA Bank Field". Pro Wrestling Sheet. Retrieved January 9, 2019. ^ "The 10 coolest moves in WWE right now". WWE.com. 26 September 2014. Retrieved 9 March 2015. ^ Cook, Steve (29 January 2017). "Cook's Royal Rumble 2017 Review". 411mania. Neville locks in a Rings of Saturn with a crossface & Swann taps the title away. ^ "WWE News: Hideo Itami Begins Using Neville's Finisher On 205 Live, Jimmy Uso Becomes WWE's New Iron Man, Clip of Miz Attacking Lawler in 2010 - 411MANIA". 411mania.com. ^ "This week's sign that Neville won't be back in WWE any time soon". ^ "WWE 205 Live: Dec. 20, 2016". WWE.com. 19 Dec 2016. Neville is poised to redefine the Cruiserweight division on WWE 205 Live. ^ "Mark Henry Says He Helped Develop Neville's Heel Persona - Fightful Wrestling". www.fightful.com. ^ "Neville: We profile new - and British - WWE Cruiserweight Champion". ^ Sirani, Jordan (24 October 2014). "WWE 2K15 WHO GOT NXT MODE ANNOUNCED AND DETAILED". IGN.com. Retrieved 6 December 2014. ^ "WWE 2K16 character art: photos". Retrieved January 30, 2017. ^ "AJ Styles, Becky Lynch to debut on 2K roster in new WWE 2K17 update". ^ SimoneSDH. "Neville - WWE 2K18 - Roster". ^ "HUGGIN' UPPERCUTS (Bayley/Cesaro) vs. NASHA (Sasha/Neville) — Rocket League Tournament Raw Semis". 15 August 2017 – via YouTube. ^ "ROCKET LEAGUE FINALS: NASHA (Sasha/Neville) vs. ROYAL 1's (Charlotte/AJ) — Rocket League Tournament". 20 August 2017 – via YouTube. ^ a b c d "Cagematch title listing". ^ "DG Open the Triangle Gate Championship history". ^ "X Wrestling Alliance championship histories". titlehistories.com. Retrieved 11 July 2008. ^ "1PW Openweight Championship history". ^ "One Pro Wrestling results from 2006". 1pwonline.co.uk. Archived from the original on 24 September 2008. Retrieved 8 July 2008. ^ "OTT No Limits Championship « Titles Database « CAGEMATCH - The Internet Wrestling Database". Cagematch.net. Retrieved 2017-01-16. ^ "PWG World Tag Team Championship history". ^ "Pro Wrestling Illustrated (PWI) 500 for 2017". The Internet Wrestling Database. Retrieved 31 August 2017. ^ "SoCal UNCENSORED Awards 2006". SoCal Uncensored. Archived from the original on 1 September 2010. Retrieved 9 April 2010. ^ "Westside Xtreme Wrestling championship histories". titlehistories.com. Archived from the original on 8 August 2008. Retrieved 11 July 2008. ^ "Westside Xtreme Wrestling results". onlineworldofwrestling.com. Retrieved 6 July 2008. ^ "WWE Cruiserweight Championship". WWE. Retrieved 29 January 2017. ^ "NXT Championship - Adrian Neville". WWE. Retrieved 25 June 2015. ^ "NXT Tag Team Championships - British Ambition". WWE. Retrieved 25 June 2015. ^ "NXT Tag Team Championships - Adrian Neville & Corey Graves". WWE. Retrieved 25 June 2015. ^ "WWE news: Spoiler - first NXT tag champs, next month's guest". Pro Wrestling Torch. Retrieved 25 June 2015. Wikimedia Commons has media related to Ben Satterly.